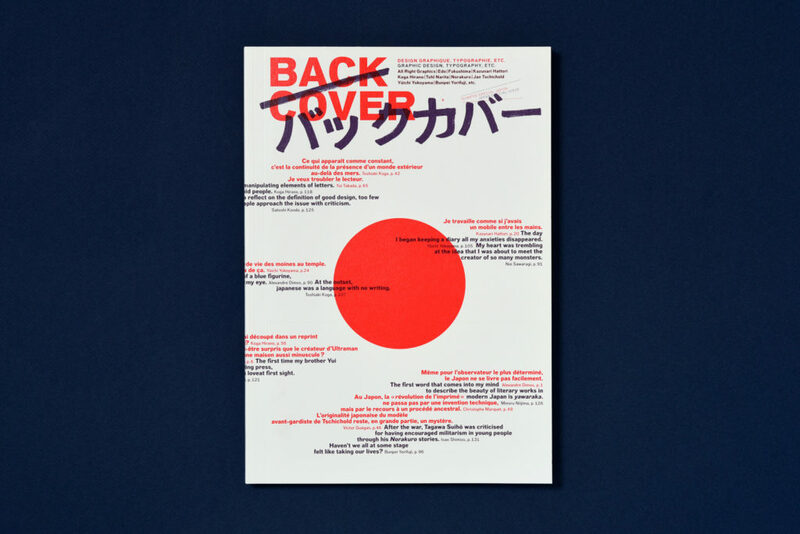 The sixth issue of Back Cover is the result of a four-month period spent in Japan. It is devoted entirely to this geographical and cultural area. Little of what is created in Japan reaches us. Our knowledge is limited to commercially viable (and hence translated) imports and to a number of marginal and more unusual aspects, occasionally introduced by enthusiasts keen to share their interest. We believe that this extraordinarily rich and multi-faceted subject deserves our attention. The linguistic difficulties and complexity of the signs belonging to Japanese culture further contribute to its interest. By travelling to Japan, we were able to get closer to the country and reach a better understanding of it. 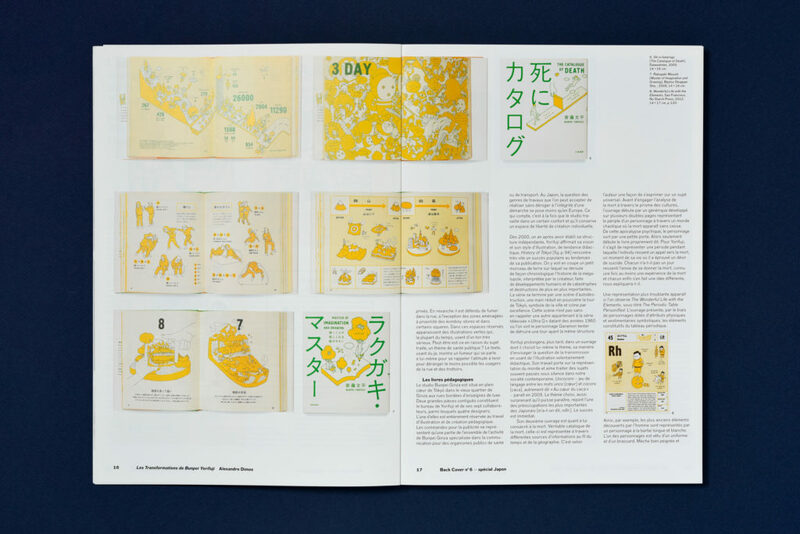 During a four-month residency at the Villa Kujoyama in Kyoto, Alexandre Dimos was able to investigate the different approaches to graphic design in Japan and give an assessment of the role played by graphic artists within Japanese society. His inquiry includes four other articles: “Bunpei Yorifuji, the Japanese Transformer”, “Flying Cakes and Balance: Kazunari Hattori Design”, “Do you Speak Japanese? All Right Graphics or the Multiple facets of the Takada Clan” (written with Jennifer Hasae). Tohl Narita was responsible for some of the dozens of monsters and characters created for the 1960s television series Ultra Q and Ultraman. Strongly influenced by the traditions of fine art, his work stands midway between academic and popular culture. 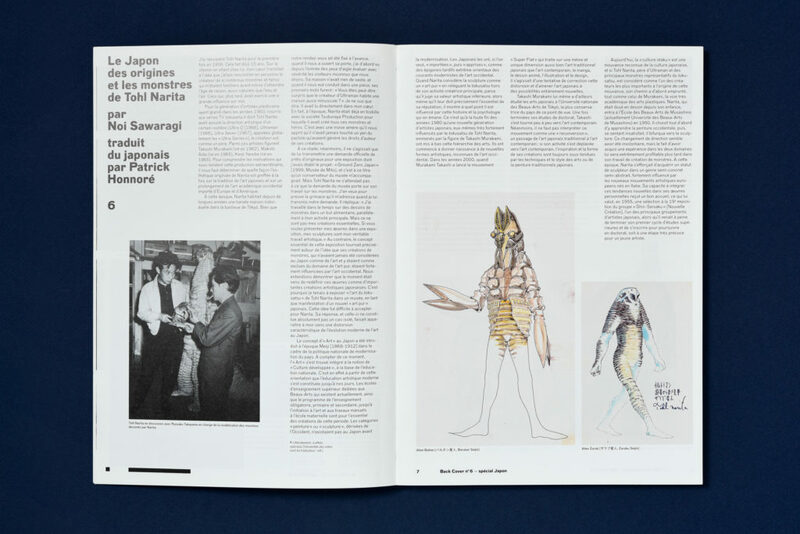 With the screen monsters “Dada”, “Buruton” and “Garamon”, young people in Japan are presented with figures derived from the history of French art. A prolific artist known for his crisply detailed pencil drawings, Yuichi Yokoyama places his stories against geometrical backdrops filled with constantly moving figures. 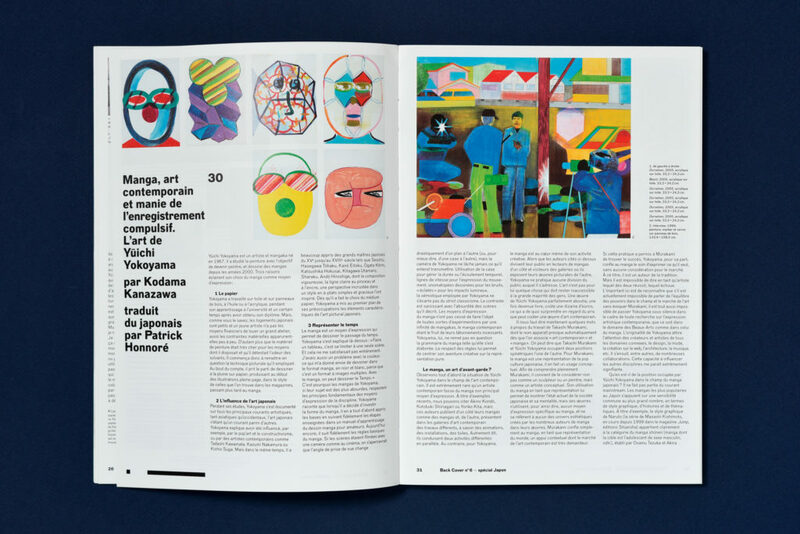 Laurent Bruel, his French publisher, went back from Tokyo with a report telling us about the sensibility and the particularity of Yokoyama. Japanese sight on Yokoyama's creation. The Fukushima disaster of March 2011 is not the first nuclear disaster to have been recorded but today, thanks to newly emerging technologies with their different temporalities, it is possible to gather together multiple ways of envisioning such an event. How do expression, interpretation and transmission take place through and with the images of a disaster? 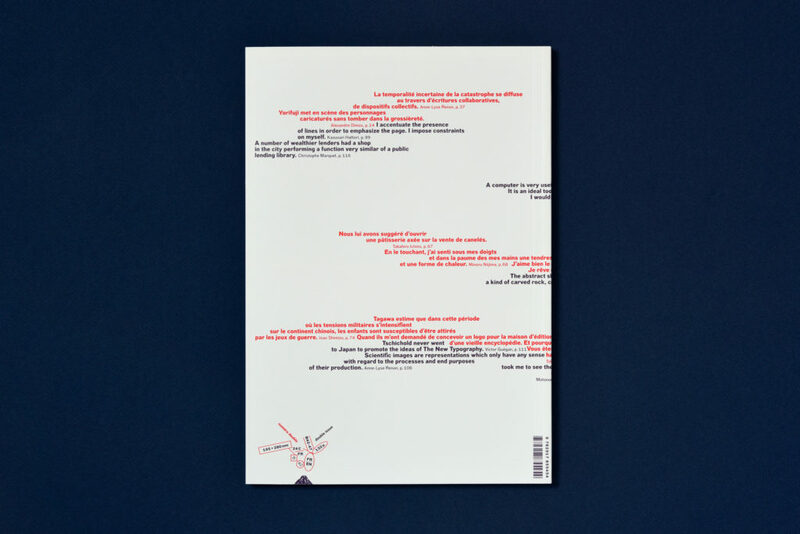 What is the role of (graphic) design in the mechanism of such a reading? 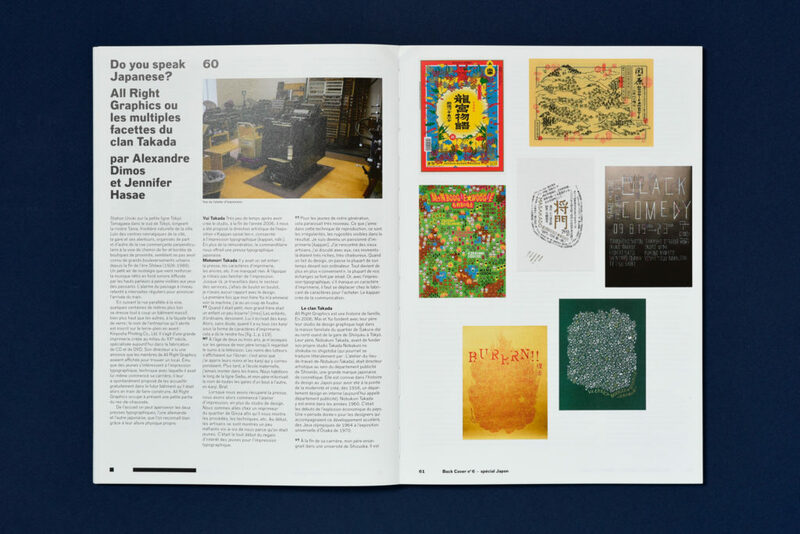 Modern typographic composition was adopted in Japan at the beginning of the twentieth century. This development coincided with the moment when the country’s leadership was pursuing a policy of westernization. Thousands of characters are required to provide a typeface for Japanese. 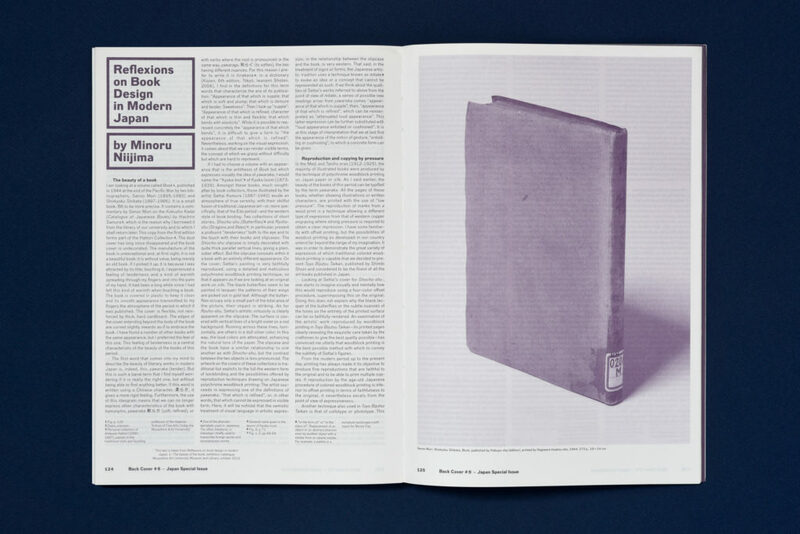 Should the roots of the New Typography be sought only in Europe? A slim volume published in 1925 and hitherto overlooked – despite its mention in the bibliography of the manifesto Die Neue Typographie (1928) by the young Jan Tschichold – was to look far beyond our old continent in seeking to understand the spectacular modernization pursued by a handful of artists and typographers in central Europe between the First and Second Wars. Written in Tokyo by a German academic, Anna Berliner, it presents a typology of advertisements from the daily Japanese press of the early 1920s. 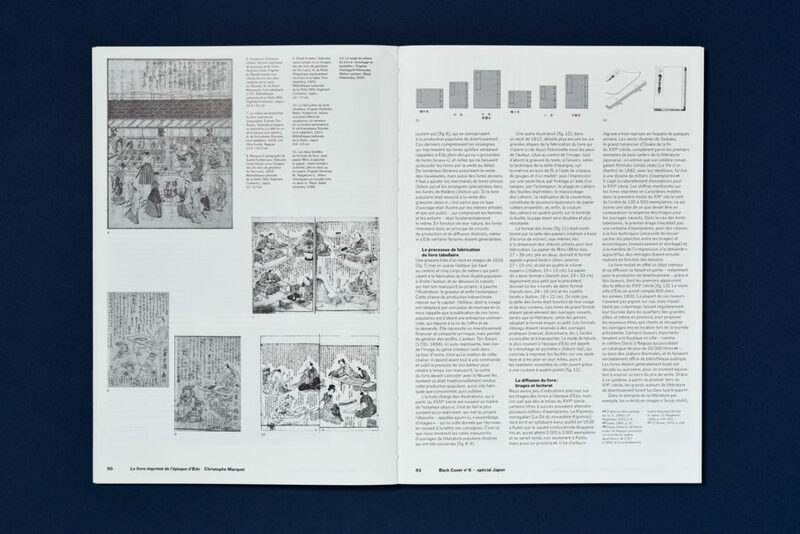 In so doing, it was able to shed light on the graphic solutions found by Japanese advertising to the problems created by the massive industrialization of printing, in particular the emergence of an agreed repertoire of symbols. During the Edo Period (17th-19th centuries), the industrial and social organization of printing was highly developed and very successful, with advanced and effective distribution methods. Printers were highly regarded, their rank safeguarded by their ownership of the wood blocks needed for printing. A look at a key moment in the history of the book. An original and significant figure in Japanese typography, Koga Hirano creates unique deconstructed typographical compositions. Portrait. Little attention is paid to creative activities outside Tokyo. Lying to the east of Tokyo, however, is Osaka, another huge urban center and one with its own particular character. 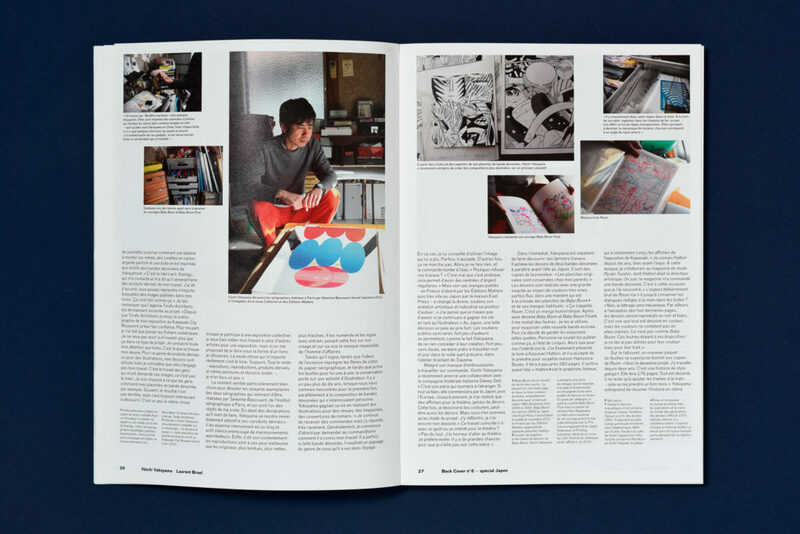 Joint interview with two young graphic designers from Kansai. Minoru Niijima is examining the book collection from the 20's of the Musashino art university library. Begun in 1931 and continuing for another ten years on the pages of the magazine Shônen Club, the manga series Norakuro was the major creation of Tagawa Suiho. Hugely successful, with sales of more than 1,500,000 exemplars, was by far the most popular manga of the 1930s – and beyond. Norakuro’s huge popularity lies in the fact that it was the first extended strip-cartoon story in Japanese. The main character is Norakuro, a soldier dog whose many adventures follow his successes and promotions... But Norakuro should not be regarded simply as a successful manga. Its style of expression was to usher in a new era and it is this “Norakuro reform” that is discussed here.